Born in nearby Dearborn, Mich., and currently playing his fourth season in the Motor City, Red Wings defenseman Brian Rafalski might seem a local kid with limited exposure to world geography. Since the mid 1990s, Rafalski has traveled -- and played -- from next-door Madison, Wisc., to Sweden and then Finland, and back to the USA in New Jersey before returning to the Wolverine State with a five-year deal in 2007 to anchor the Wings' blue line with Nicklas Lidstrom. Each one of these five sites produces enough personal and puck stuff to create a biography worthy of NCAA, international and NHL distinction. 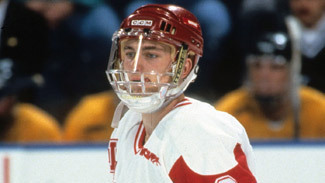 Four straight NCAA Tournament appearances for his Wisconsin Badgers from 1991-95 -- as well as a degree in economics -- and three Stanley Cups -- two with New Jersey (2000 and 2003) and one with Detroit (2008). Now in his 11th NHL season, Rafalski has 507 points in 821 games -- a .62 points-per-game average, placing him among the top 10 percent of all current NHL defensemen. The current NHL average for this elite group is .55. His 2010-11 total thus far is 40 points in 51 games for a .78 average. Rafalski has played at least 73 regular-season games in nine of the past 10 seasons. "I was living in Madison my senior year of high school," a reserved Rafalski told NHL.com about the beginning of his stellar career, "playing for the (USHL Madison) Capitals and got to know the university -- and liked it. I knew I had a lot of opportunities to play as a freshman; they had a lot of players leaving. "And it was the Big 10, and we had big rivalries with teams like Michigan." Rafalski's freshman season would end with his best shot at winning an NCAA championship. His Badgers took out Michigan 4-2 in the semifinal before bowing to Lake Superior 5-3 in the title game. "That first year was a great opportunity," Rafalski said. "It was difficult to lose that last game against Lake State." The 1993 and 1995 NCAA tournaments included classic battles between the Badgers and Wolverines with Michigan prevailing in each, 4-3 in OT in the '93 Frozen Four semifinal, and then by the same score in the second round in 1995. Sandwiched between was a second-round 4-1 loss to BU in the 1994. "The last year when we lost to Michigan, we played Michigan State the night before and that back-to-back was tough to lose on home ice (Milwaukee)," Rafalski said about his last college game. "Mike Kemp, our defense coach, really worked with us. It was a four-year process of working on certain things each year. It culminated in a very good senior year." Rafalski was named WCHA Defenseman of the Year after producing the Bobby Orr-like stat line of 45 points in 43 games. "We won the Final Five once and always seemed to be second or third place in the WCHA standings and tournaments. I still keep in touch with friends and players in the Wisconsin and Minnesota areas," he said. What is the genesis of Rafalski's success as an offensive force on the blue line the past two decades? "Growing up, teams I played on focused on passing and moving the puck; getting everyone involved and that just translated though the years. I just kept working and working at it," he said. One would assume that 121 points in 146 games at Wisconsin would have NHL teams bidding for his services as a free agent during the spring of 1995. Again, quite the opposite. Rafalski's path to the NHL was not as smooth as the sheet under his smooth-skating stride. He headed to Sweden for a season before spending the next three in Finland. In his last year abroad, 1998-99, Rafalski put up another eye-opening scoring season with 53 points in 53 games. "Finland was a job," said Rafalski, referencing size as the likely reason the NHL initially passed on him. "I took advantage of that opportunity, and when the NHL expanded, opportunities opened here." How did the Finland experience impact his NHL success? "Playing in Finland with a lot of highly skilled players helped all of (my game)," he said. "A different philosophy (about offense) there that I was able to develop with a lot of playing time. We had good successes and won some championships. Skating, conditioning and seeing the ice and the amount of practice time over there with the number of games (60-70) really got me ready for here when I came back. "The first year was not that successful (in Sweden), but the second, third and fourth were (in Finland). "I took it year by year there, contract to contract. You looked to have a good year so you'd have a contract the next. My focus then was continue to improve." Improve he did, all the way to a Stanley Cup in his first season with the Devils, 1999-2000, and then again in 2003. His first season in Detroit, 2007-08, also led all the way to him hoisting Lord Stanley. "The two experiences (with New Jersey and Detroit) are very similar," Rafalski said. "The first year, obviously, winning the championship at each and then losing in the Finals the second and then being knocked out (of the playoffs) early in the third year. "I guess that means we're supposed to win it this year," he said, smiling about the Wings possibly paralleling the Devils' three-year Cup calendar in 2000 and 2003 by replicating it in 2008 and 2011. "I've been on some very good teams," Rafalski said. "I came into New Jersey with some very skilled players and fit in real nice playing with some real good defensemen early in my career like Scott Stevens, and Scott Niedermayer, and having Larry Robinson as coach. "All that continued (in Detroit). I've just tried to learn from who is around you. Take this, and ask, 'Can I use that? How can I use it, and in what part of my game?' Just absorb things that are important. "Each Cup was special with the path to each; each takes just as much effort. It is the highest echelon of this sport." Last April, the Wisconsin Badgers made it to the highest NCAA echelon -- playing for the national championship against Boston College, ironically at Ford Field in Detroit. Rafalski met with the team before the final game. "My message last year to Wisconsin was to not overlook the early games," he said. "You can talk about the final game later. That other team thinks they can win, and obviously they played well to get here, so don't look past them. Unfortunately, I didn't get to talk to them before the final game [a 5-0 loss to Boston College]." The 16 teams for this year's NCAA Tournament will be announced Sunday. Wisconsin is not a likely entrant, given two early-game losses in last week's first round of the WCHA playoffs, and a pairwise rank at No. 19. With a year left on his Detroit contract and turning 38 in September with three young sons, how does Rafalski look at his and their futures? "No plans for and after retirement; whatever the good Lord will let me do," he said. "Whatever they want to do is good; no push in any direction. Let them explore opportunities and make sure they do their best."